How to clone a dashboard? You’ve created the perfect dashboard, and you would like to replicate it? We know you have other things to do, so don’t start from scratch all over again. Just clone it! When you clone a dashboard, the clone will be exactly the same as the original: same widgets in the same place, same title, same logo, etc. Obviously, you’ll be able to change these whenever you want, just like any other dashboard. 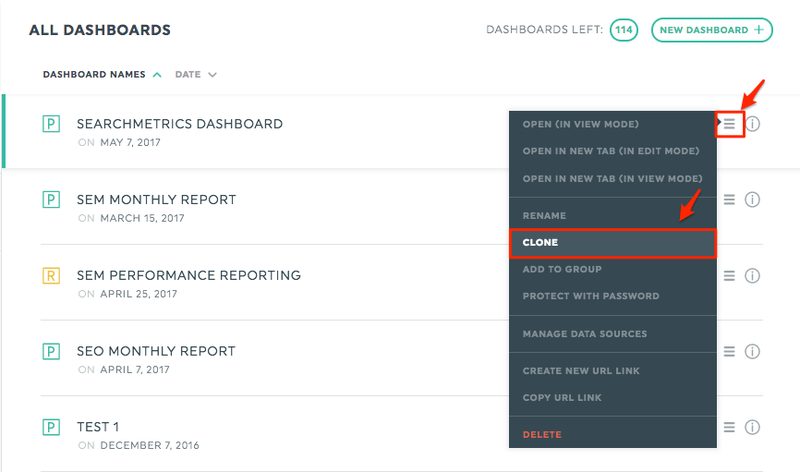 1- In the Dashboard Manager, locate the dashboard you want to clone. 3- Follow the steps to create the new dashboard. You’ll be able to replace each of the data sources from the dashboard you’re cloning. However, if you want to keep the same sources, just click “next” and your new dashboard will be identical to the cloned one! How to create a bookmarklet to automatically convert a URL?